The Otis H. Chidester Museum has one of the largest collections of Scouting memorabilia in the world. Otis H. Chidester was born March 22, 1903 in Mineral City, Ohio and spent his early years in Susquehanna, Penn. Chidester became a Boy Scout on September 8, 1912 and after more than eighty-four years was the nation’s senior Scout in continuously registered and active service. He became an Eagle Scout in 1935, received the Silver Beaver Award in 1948, and was named a Distinguished Eagle Scout in 1993. At the time of his death on February 22, 1997, he was revising his monograph on the history of Scouting in Southern Arizona. His home has always been the museum headquarters. Chidester made many contributions to scouting and worked with the National Supply Division to replace the bulky horseshoe shaped blanket rolls used by Scouts. The result was a zippered bag called the Arizona bag, a type of sleeping bag. 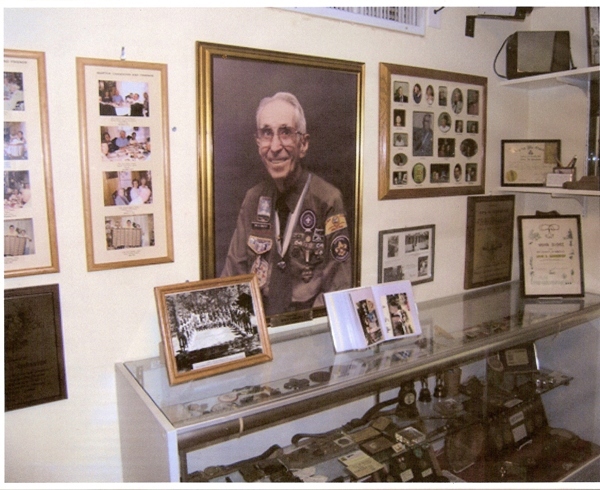 In 1984, he established the Scout Museum of Southern Arizona, which members changed in 1992 to the Otis H. Chidester Scout Museum of Southern Arizona. Chidester taught at the Arizona State School for the Deaf and Blind from 1937 to 1940. He earned his B.A. and M.A. degrees from the University of Arizona in 1940 and 1948. He founded the graphic arts department at Tucson High School in 1940 and served as department chairman until 1968. He was inducted into the Tucson High School Hall of Fame in 1992. The museum collects, preserves and exhibits written, photographic, audio and other physical records, artifacts and memorabilia relating to the Boy Scouts of America, with an emphasis on scouting in southern Arizona and the Southwest. Exhibits features historical photos, patches, badges, books, Scout apparel, camping equipment and Scout knives, along with a collection of Scout related art. Hundreds of old Merit Badge pamphlets are either on display or in the museum library. Many of these pamphlets are from Otis Chidester’s personal collection. Others were donated to the Museum. Each room in Chidester’s former home features special exhibits. The Cub Room contains training and informational material which includes Pow Wow notebooks, Webelos Scout Helps, Pack Administration and Leadership. There are also World Cub Scouting patches, dated registration cards and other Cub items. The Display Room exhibits a rare and quite complete collection of books by Ernest Thompson Seton, dating back to 1899. Excerpts from these books were incorporated into the first Boy Scout Handbook. Books by Dan Beard date back to 1882. The 1908 Scouting for Boys by Lord Baden-Powell made no mention of standard advancement tests. Then in 1910, following the incorporation of the Boy Scouts of America on February 8, 1910, the Official Handbook of Boy Scouts of America by Ernest Thompson Seton and Lieutenant-General Sir Robert S. S. Baden-Powell. Seton was authorized to put together a temporary Scout Handbook. This he did by taking part of the 1908 Scouting for Boys by Baden-Powell and part from his Manual of Woodcraft Indians, adding the outline for the American Boy Scout program. This program included Tenderfoot, Second Class, First Class and the fourteen English merit badges. Norman Rockwell had a long association with Scouting. On a hall wall are six registered and rare Norman Rockwell plates. There are reproductions of paintings by Rockwell who also did fifty-two scouting calendars from 1925 to 1976. The mug room features more than five hundred Scout mugs. The museum’s Trading Post has items available for trade or purchase to help support the museum.